Angry Birds Dream Blast is a new puzzle game from Rovio Entertainment Corporation. Burst dream bubbles with the baby Angry Birds to solve puzzles and make naptime extra dreamy. With so many unique puzzles to solve, and more added every week, you can truly live the dream. 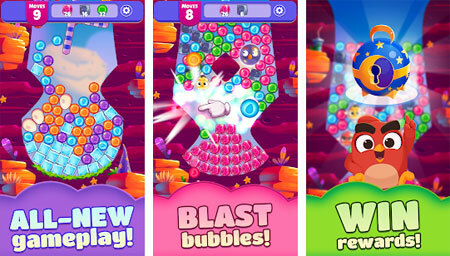 The game is all about popping bubbles and combining boosters. Just tap to pop groups of similarly colored dream bubbles. Pop enough bubbles at once and you’ll earn a Red booster. Tap Red to take out a row of bubbles or combine two Reds to make a Chuck that pops bubbles in four directions. Combine two Chucks to make the extra powerful Bomb booster. Baby Bomb may look cute, but his explosive energy can even clear an entire screen of bubbles. Combine more bubbles at once to create more powerful boosters. If you get stuck in the game, check out the video walkthrough and gameplay for the game. This entry was posted in Android Games, iOS Games, Mobile Games, Walkthrough and tagged Angry Birds Dream Blast Cheats, Angry Birds Dream Blast Gameplay, Angry Birds Dream Blast Guide, Angry Birds Dream Blast Strategy, Angry Birds Dream Blast Walkthrough by Marvin. Bookmark the permalink.